Wooden gift box - Kraft cocoa beer 33cl + assorted chocolate bars in a paper box 300g. 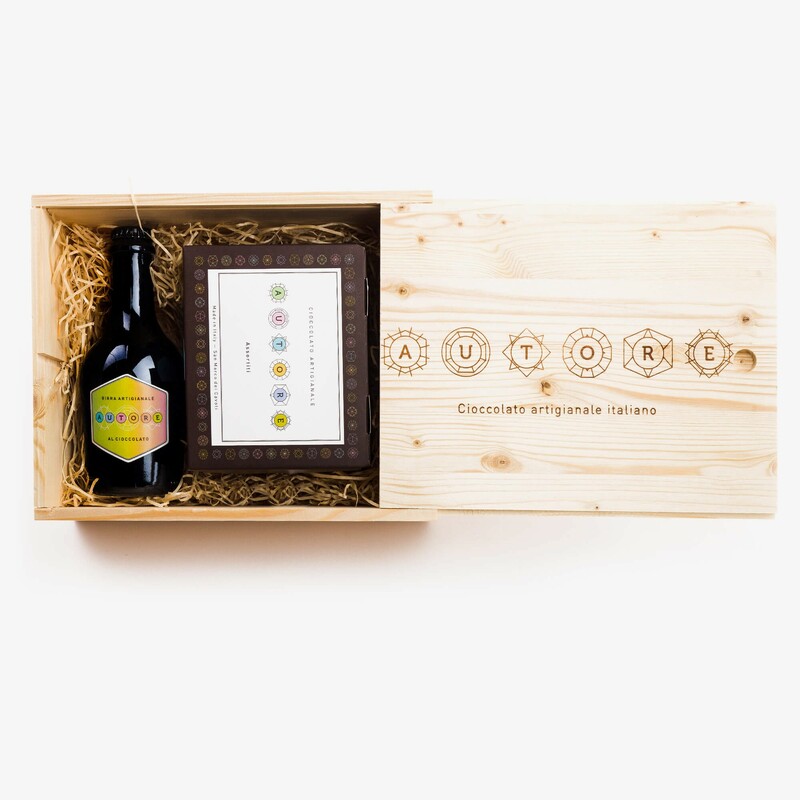 An original wooden gift box, with logo Autore engraved on the surface and a cord handle for the transport contains a glass bottle of kraft cocoa beer 33cl and assorted chocolate bars in a paper box 300g. Perfect for a gift, a smart wooden box containing a bottle of chocolate craft beer 33cl with monk-robe color enriched with cocoa beans and an extra fineblend of dark chocolate. With rich and creamy foam, it is brewed with toasty mailts from England. Produced in collaboration with "Karma Brewery" at Avignano in the province of Caserta and an elegant paper box contaning 300g of assorted chocolate bars. We recommend storage of the beer in a cool place and the temperature between 8° and 10° C. It accompanies well desserts and is a great combination with raw fish. Beer: Water, BARLEY malt, cocoa beans, sugar cane fair circuit, hops and yeast. Produced in collaboration with "Karma Brewery" at Alvignano in the province of Caserta. Croccantino: Sugar (35%), HAZELNUTS (20%), ALMONDS (15%). Covering (30%): cocoa beans, sugar, pure cocoa butter, cocoa (Min.62%), emulsifier (SOY lecithin), natural vanilla extract. Honey and Raisin: Sugar (25%), HAZELNUTS,(15%), ALMONDS (13%), raisin (12%), honey (5%). Covering (30%): cocoa beans, sugar, pure cocoa butter, cocoa (Min.62%), emulsifier (SOY lecithin), natural vanilla extract. Honey and Figs: Sugar (25%), HAZELNUTS (15%), ALMONDS (13%), figs (12%), honey (5 %) . Covering (30%): cocoa beans, sugar, pure cocoa butter, cocoa (Min.62%), emulsifier (SOY lecithin), natural vanilla extract. Gianduia: Sugar, HAZELNUTS, ALMONDS, HAZELNUT PASTE, cocoa mass,cocoa but ter , cocoa (min 26.5%.). Covering (30%): cocoa beans, sugar, pure cocoa butter, cocoa (Min.62%), emulsifier (SOY lecithin), natural vanilla extract. Gianduia Coffee: Sugar, HAZELNUTS, ALMONDS, HAZELNUT PASTE, cocoa mass, cocoa butter,cocoa (min 26.5%. ), coffee powder. Covering (30%): cocoa beans, sugar, pure cocoa butter, cocoa (Min.62%), emulsifier (SOY lecithin), natural vanilla extract. Mint: ALMONDS, sugar , glucose, powdered sugar, fondant sugar,cons. E202, mint syrup. Covering (30%): cocoa beans, sugar, pure cocoa butter, cocoa (Min.62%), emulsifier (SOY lecithin), natural vanilla extract. It may contain traces of SHELL FRUIT, MILK, EGGS and PEANUTS. Sugar, hazelnuts, almonds.Covering: sugar, cocoa paste, cocoa butter, cocoa (min. 53%), natural flavours, lecithin. It contains nuts, lactose and milk proteins.